When it comes to our pets, there’s not much we wouldn’t give them…we just want them to have the best and be the healthiest they can be. 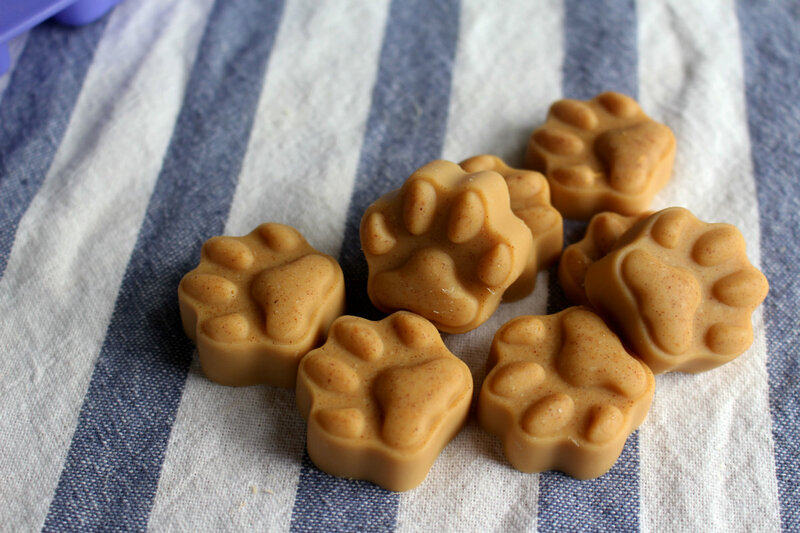 Because of this, we recently started making our own dog treats; there’s something about knowing exactly what’s going into them that gives us peace of mind, and these peanut butter coconut oil treats are our new favorites – they’re just so good for our (not so) little fur babies!! While all the rage with people, it turns out coconut oil is great for your pets as well! Here, we use it because it improves overall skin and coat health (it moisturizes and reduces itchiness due to allergies or eczema), but it’s also been linked to preventing diabetes and heart disease – win-win! Putting the batter together is really simple, so then all you have to do is pour it into an adorable silicon ice cube tray and stick it in the fridge or freezer; it’s that easy! If your coconut oil is not already liquid, place it in a medium saucepan over medium-low heat and cook until melted. Add in peanut butter and cinnamon and stir until mixture is completely smooth and incorporated. Note: mixture should be thick, but pourable. Pour mixture into silicone ice cube trays and refrigerate or freeze until set. *For exact coconut oil measurements, we use 1 teaspoon per 10 pounds dog’s body weight, or 1 tablespoon per 30 pounds. **Start with about 1/4 dose of coconut oil and gradually increase over the course of several weeks so your pup can get acclimated.